A new species of myxosporea (Henneguya rotunda n. sp.) was found in the membrane of the gill arch and the fins of Salminus brasiliensis in the Mogi Guaçu River, municipality of Pirassununga, São Paulo state, Brazil. 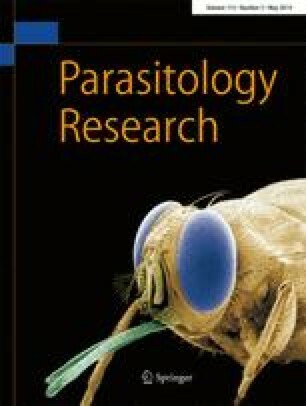 Morphological and morphometric analyses using light microscopy revealed parasites with similar characteristics at both infection sites. The mature spores found infecting the fins had oval spore body with 7.1 ± 0.2 μm in length, 5.6 ± 0.2 μm in width, 3.7 ± 0.1 μm in thickness, 16.4 ± 1.2 μm in length of the caudal process, and 23.6 ± 1.1 μm in total length of the spore. In a frontal view, the polar capsule was observed to be symmetrical with 3.4 ± 0.2 μm in length and 1.8 ± 0.1 μm in width. Mature spores contain six to seven turns of the polar filaments. The morphometric data concerning the spores obtained from plasmodia from the membrane of the gill arch were similar to those from the fins. Ultrastructure analysis revealed that the plasmodial wall was formed by a single membrane and had numerous pinocytotic canals connecting the outside of the plasmodia to the ectoplasm zone. Beyond that, various electron-translucent vesicles also were observed at the periphery of the plasmodium. The molecular analyses of the 18S rDNA gene from the spores obtained from the gill arch membrane and fin membrane showed that these sequences shared 100 % similarity. Phylogenetic studies using maximum parsimony and maximum likelihood methods demonstrated the polyphyletic clustering of the myxosporean parasites of characiform fishes. H. rotunda n. sp. clustered as a sister species of Myxobolus pantanalis, also a parasite of S. brasiliensis. This study was supported by CNPq, the Brazilian National Council for Scientific and Technological Development (grant number 477658/2010-5). The authors are grateful to doctoral students Juliana Naldoni and Mateus M. Carriero for their help with the laboratory analyses and Tiago Milanin for providing the line drawing.